Ventured into the house today—not all the way in, just a foot or two inside the front door, which stood wide open “airing the place out,” which, as I’ll explain in a moment, is a laughable impossibility. The electricity is turned off in preparation for repairs to start, so the whole place is dark. In this photograph, you can see all I saw. I reached into the coat closet, which is still littered with our shoes, mostly mine: about six pairs of soot-caked flipflops under the cover of all my soot-caked coats. Now, I’ve been warned that even though a lot of our stuff looks “surprisingly okay,” it will never be usable again because of the persistent smoke odor. It’s more than an odor, the fire inspector has explained (backed up by our former landscaper who—alarmingly—used to be an arson specialist). According to these experts, all our stuff is so deeply penetrated by smoke, that the smoke has essentially changed the chemistry of each item so it is now actually part smoke. There’s something very sci-fi about that but it seems to be true. Yesterday, my husband brought a bin of Stuff-From-The-House over to the house we’re staying in. He couldn’t bring it inside or our friends’ house would very quickly smell as if the fire had taken place here rather than there. Jon told me to pick over the bin full of notebooks and school books, jewelry– mostly my daughter’s–and a few little chachkies, to see what might be usable. A cloud of toxic dust rose into the air as I lifted the lid of the bin. Gasping for breath, I rummaged, though it was clear that anything inside would need major rehabilitation before resuming its intended function. But all my daughter’s beaded creations, acquisitions from Claire’s and friendship bracelets were in there, a memory attached to each. If I could rescue just one trinket as a memento, I thought, just a pair of Zoe’s earrings; it would mean so much. I gulped air as I hunted; the soot and smoke smell from the bin’s contents was near asphyxiating. Everything was thrown together and a uniform shade of dark grey, too, making it difficult to identify anything. What I finally came away with were a pair of pink Eiffel Tower earrings from the Epcot Center. So tiny, I thought, and so easy to clean. Well, I scrubbed them for about fifteen minutes—black muck kept spewing from the diminutive crevices. Each time I thought the earrings were clean, there was more. Finally they sparkled. Triumphantly, I presented them to Zoe. “Do they smell?” She asked, because even pre-fire, she was very sensitive to bad odors. “I don’t think,” I said, not realizing that by this time I smelled just like the earrings and was past the point of noticing. She smelled them herself. “Yuck,” was the verdict. She handed the earrings back. I left them in the bathroom, but later returned to find that the whole place now smelled like an old man with a bad cigarette habit. Just from those tiny earrings! Into a Ziploc they went. I was so glad to get my boots out, even though I could see and smell that they’d function better as smokestacks now than garments. But hey—they were black to begin with, right? I’m putting them in a garbage bag and going to research online to see if there’s a fairy godmother for rescuing your favorite boots when they’ve been through a house fire. What’s weird though, is how easy it is to get rid of the stuff that was just stuff. From a whole toasted-up drawer of paraphernalia, to extract one special thing: a letter, a photograph, a rock with a tree painted on it and my son’s haphazard “THEO” crayoned on the bottom—and then to say: toss the rest without a single pang of regret. We had so many things we didn’t need, I realize now. This kind of reboot does nothing if not show you what really matters. Humpty just didn’t get cause and effect no matter how many times we read the book. I’ll take this recorded memory over the good china any day. I don’t really care how it smells either. This entry was posted in Childhood in America, Children's Books, Loss, The House Fire Chronicles and tagged House Fire, Humpty Dumpty, memories, smoke, soot-caked. Bookmark the permalink. Oh Lisa, this is so poignant and tender and sad and hopeful all in one. Beautifully expressed — and my heart is full, and empty, and broken wide open reading it. Louise put everything I feel into just the right words. I won’t even attempt to find other words. And I had no idea smoke was so sinister! It’s like the Body Snatchers. Body snatchers captures it exactly, Scrollwork. You recognize the thing, but it isn’t itself at all. I have a feeling your children will quickly heal Lisa. I am so glad about the notebook. That is a precious recovery. It is hard to think about what might be missing. Steve, thank you so much. Your words mean so much! 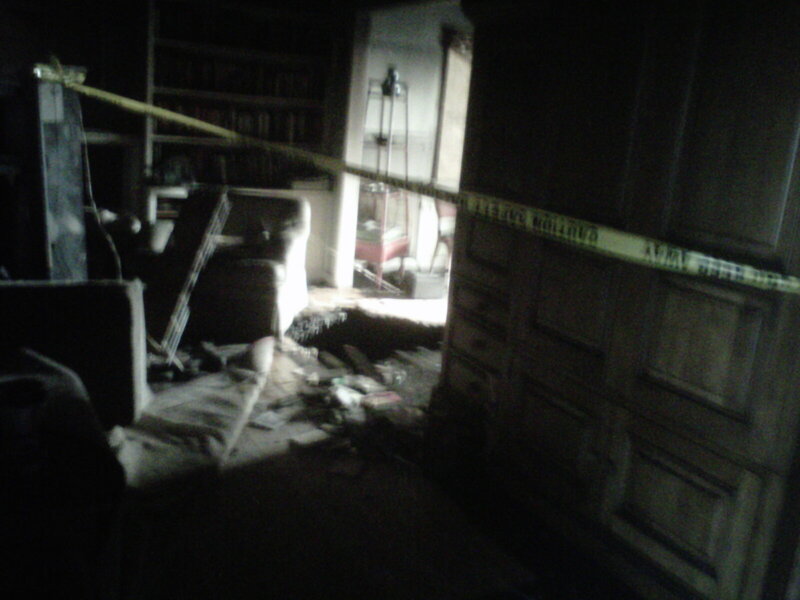 When my parents passed away very close to each other one of my sisters and I were tasked with clearing their home. We are the ‘strong ones’ (don’t ask). My parents were actually my step-mother (who was also my aunt) and my father. One of our jobs was to go through all the pictures, twenty years of their life together, but also over 100 years worth of our family pictures since we were also cousins. It was a journey of discovery, tears but mostly love. I wouldn’t trade that week for the world. I have most of those pictures today as I am the family journaler and it is a project that is still underway. The loss of those memories is heartbreaking. I am glad you found the journal. I read about the fire..wow and how sad, yet relief for you that you and family are all safe. Hope you and your family pull out of all this disaster over time. Meanwhile you have your blog…also saved from a fire.